I studied linguistics. Something professors of linguistics will do their best to drill in you is that linguistics is a descriptive subject, not a prescriptive one. It does not order, it observes. It’s not the stern father, more like the tolerant great-aunt. You can correct other people’s mistakes as much as you want, but the truth is that languages are alive and are only a reflection of people who create them and speak them. They fill a need and bend to that need’s evolution. There is a reason my first language isn’t Latin. Trying to stop a language from evolving is a little like trying to get clouds to stop shifting their shapes. I think food should be descriptive as well. I remember a flatmate offering me a cold slice of her Domino’s, the cheese congealed, the sparse pepperoni looking a little lonely, and saying “Oh, sorry, that must be very offensive to you”. Of course, that’s silly, isn’t it? The idea that because of its very existence, by virtue of being a different matter to the pizza which was invented in my homeland a few hundred years ago, this innocent pie, flat bread and melted cheese and tomatoes, could be offensive. Being a food purist is a thankless, futile task, yet I am still ultimately one. A reformed food snob, but it’s very much a process. I won’t order a pizza if the menu has the sort of typos on it which make it blatant that no Italian was involved or even within a 1-mile radius when they wrote it up. No chicken or beef on a pizza. No pineapple. No cheddar. The list goes on. Of course, I go for half and half. Because while I do have my insurance in the form of a non-fussy all-eating boyfriend, I cannot stand the guilt of creating two 9-inch perfectly round abominations (I’m working on less judgemental language). One will suffice. The improbable toppings I am yet to choose will have to fight for their spot on the plate. Scrolling down the pictures to choose my left half, I notice how plasticky the meat is, all pink and shiny and sweaty, a little pool of oil collecting in the middle of slightly concave slices. I like ham on pizza, but this ham – too pink, too uniform, like it didn’t come from the leg of an animal but was condensed into reality out of a crayon drawing. You can choose the crust. I go for regular, because my heart cannot take a crust stuffed with “mozzarella” cheese. I can also choose the sauce. There is innocent, “Domino’s own” (as if that was a great stamp of approval in the world of tomato sauces) sauce. Or, errr, barbeque sauce. The gloopy sugary stuff, you know, that you dunk your McNuggets in when drunk and full of self-loathing. Look, I go for barbeque sauce. I can also add three toppings for free (bargain). I go for the ever divisive sweetcorn, mushrooms and chilli peppers in the hope they will distract me from everything else that’s going on. Some of the toppings are confusing (ground beef – why? Domino’s herbs – which herbs? ), others just wrong (more on that later). It’s time to choose my right half, and really I feel like I’ve been playing it safe. Sure, the barbeque sauce was a bit of a curveball, and one I’ll probably regret later when I’ll inevitably have to pop to Tescos to buy all their Gaviscon. But I don’t feel like I have quite reached my full Domino’s potential. I get the tandoori hot pizza, registered trademark even (how did they manage to do that), but quickly remove the red onion because I have to draw the line somewhere. I do add the generic “herbs”, because I just need to know what that pile of dusty-looking dry greenery in the picture actually is. I get an email asking me to get myself ready for “pizza heaven”. I am shocked by the sheer hubris. The delivery tracking device, starting up with a number of ’70s sci-fi sounds is bound to be a jumpy person’s worst nightmare. He is, I can only assume, a millenial anthropomorphic pizza-shaped AI with sad eyes. He’s called Dom (get it?) and takes ages explaining how basic colour-coding works. When he’s not talking to you (and he talks a lot), the screen becomes a series of pizza and smiley emojis with some sort of dystopian grainy filter. It’s as disturbing as it sounds. Dom enjoys puns and tells dad jokes before flashing “LOL”. Two jokes in, my pizza is already in the oven. It spends quite a while there. 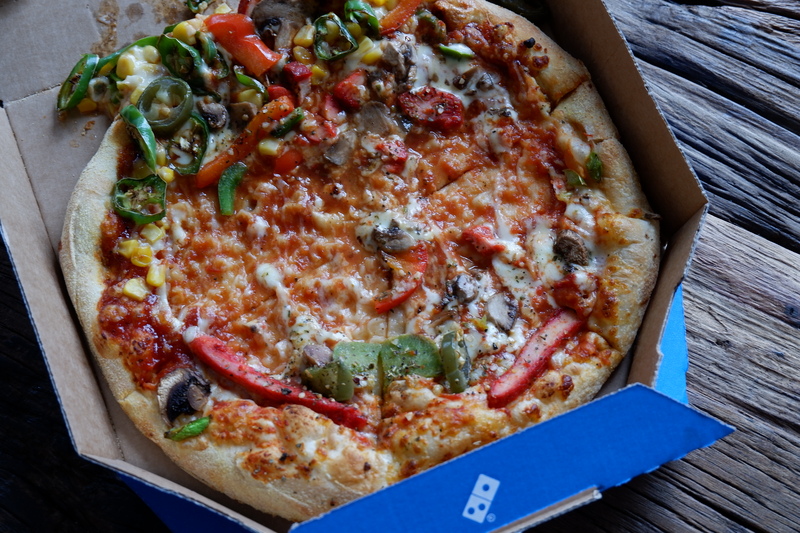 How do they even bake an half-and-half pizza? Do the toppings not spill, or slide scross the other side while baking? What happens to the rogue toppings? The pizza shows up. I am filled with a sense of shame as I go to the front door, a sense of shame which I truly cannot explain as I have numerous times had McDonald’s delivered late at night even though my closest joint is a five-minute walk away (my order is a single cheeseburger and a caramel sundae). The pizza smells good. Genuinely good. Charred peppers and cheese. Good. 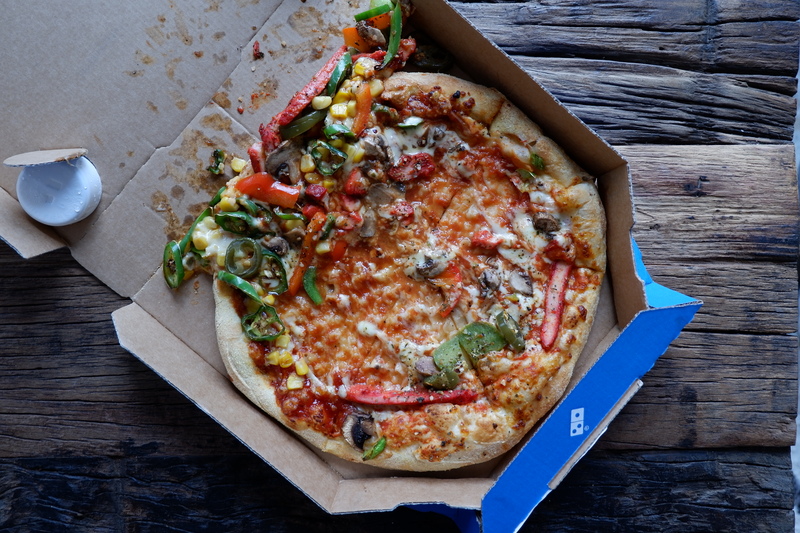 Remember my question about how toppings stay put in a half-and-half? They don’t. I have to spoon back toppings, carefully trying to discern which half is which (turns out barbeque sauce looks deceivingly like tomato sauce). In the end it becomes a little of both, corn and red tandoori chicken pieces mixing and melting into a single cheesy mess. The crust is soft and fluffy, less bready than real pizza, fattier and more supple. The barbeque sauce is genuinely not bad. It’s just sugary sweet. The cognitive dissonance is painful but in a world of waffles with maples syrup and fried chicken this is not the most adventurous contrast out there. The cheese is barely-present and so uniformly laid I can only assume a super-intelligent machine did it (Was it you, Dom? ), but there is innocent sweetcorn, well-charred chilli slices, pickled japaleno lending some much-needed acidity. The slivers of chicken, fiery red and cumin-heavy if a little dry, make the tandoori half taste a little like a kebab. I enjoy it. I enjoy as something different to the pizza I grew up with. It also goes really well with some very cold Peroni in the glass bottle. But then, few things don’t. I also never really find out what the “herbs” were.